Wood shredder_Raymond mill Machine_Mining Machinery_High Quality Grinding Equipment_Grinding Equipment-Zhengzhou Shuguang Heavy Machinery Co., Ltd.
Wood shredders, also known as shear shredders, reduce material size by shearing, tearing and squeezing. The shredder produced by our company has been researched and practiced for many years, and has been researched and developed according to the actual situation in the country. It has introduced a series of wood shredders with mature technology and advanced design, which provides for the crushing and volume reduction treatment in the early stage of waste recycling in China. Quality reliable equipment. The machine can be widely used in wood, wood trim, wooden pallets, solid wood, branch paint buckets, waste appliance shells (plastic shells, metal shells) and other large-volume waste. The wood shredder is a multi-functional, highly versatile machine. It adopts standardized modular design, good interchangeability of parts, and refined by forging die forgings. 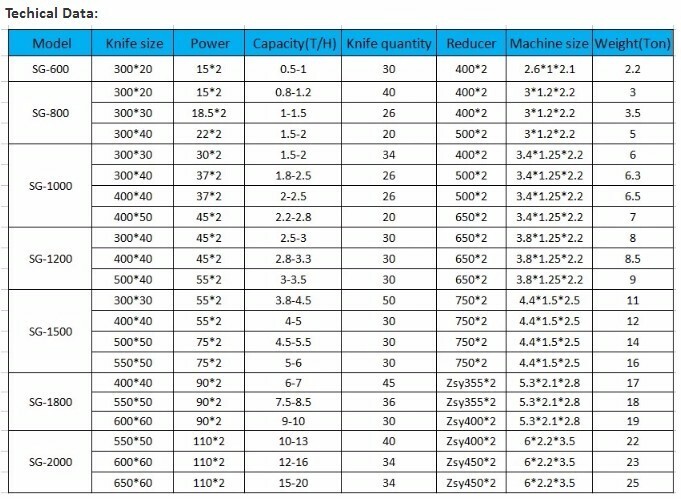 The main knife adopts special alloy steel through special special process. Made of high wear resistance and high strength, the drive part adopts intermediate gear transmission to form a differential relationship. The screen is easy to disassemble, and the appearance is beautiful and the structure is compact and compact. Moreover, the equipment also has the characteristics of reasonable structure, high quality of cutting materials, large output, low power, etc. It is the first choice for cutting miscellaneous wood, trim, tree technology and waste wood.